PAWS Animal Welfare Shelter presents Moxie as PAWS Pet of the Week in hopes that this cute cat will find her forever home. Moxie is a young, beautiful, brown tiger from Madawaska. PAWS Animal Welfare Shelter presents Moxie as PAWS Pet of the Week in hopes that this cute cat will find her forever home. Moxie is a young, beautiful, brown tiger from Madawaska. Found as a stray, she is very sweet and appreciative of love and care. 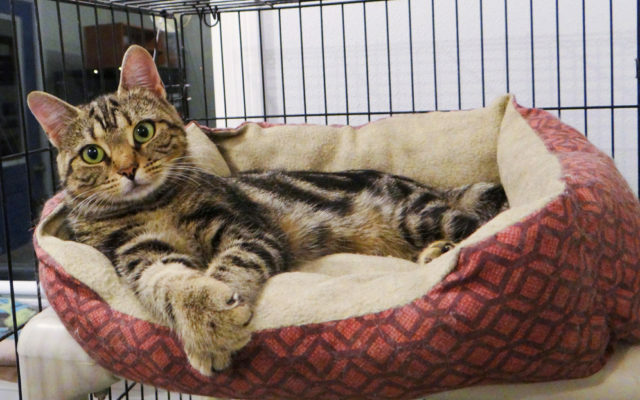 She gets along well with other cats and will make an excellent companion to her new owners. Moxie is spayed, up to date on her vaccinations and cleared of any parasites. To see her, visit Valley Cat Haven during open hours Saturday from 11 a.m. to 1 p.m., Tuesday from 1 p.m. to 3 p.m. or call Jean at 543-7348 for an appointment.